Your Scout can wear this shirt when transitioning to Boy Scout, so you may want to purchase this larger than needed today. *If purchased earlier in the summer, the scout shop may have shirts with National and Council Patches already sewn on. *Note: A Webelos Scout may wear either the Blue or Tan shirt. If you are just signing on as a Webelos, it is recommended to purchase the Tan uniform. *If the uniform is a financial hardship please contact the Pack Committee Chairman for assistance. ​Scouts in uniform are more conscious of their role in Cub Scouting, and feel a sense of pride and belonging when wearing one. A uniform provides a proper place for the display of badges earned and a way for him to ‘show the world’ that he has been rewarded for his achievements. In addition, Scouts in uniform create a strong, positive, visible image in the community that helps to strengthen the important ties between the public and the Scouting organization. 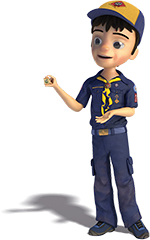 The Scout ‘Class A’ Pack uniform is worn to the Pack Meetings and other events, as specified by Pack Leaders. The main article of the uniform is the shirt, as it displays the rank of the Scout, and identifies him as belonging to a certain Den, Pack and Council. When purchasing a new uniform, remember that your son is growing and if, for example, he is now a newly signed up Wolf Cub, get an extra size or two larger, so he can wear it for his Bear year as well. The tried and true method is to get a shirt that reaches your Tiger’s knees, he will grow into it. As we are operating as a ‘Jeans Pack”, blue jeans, in good condition, are a comfortable alternative to the official Scout uniform bottoms. The official Scout uniform bottoms are acceptable if you already own them. Pack 89 has a ‘Class B’ Pack T-shirt and will have them for sale and/or order at many of our activities. In addition to the purchasing of a uniform, there will be many patches that need to be sewn on your son’s shirt. Please pay close attention as to where on the uniform these need to be placed. (Please refer to uniform inspection sheet below). It is important that when your son receives a badge that is to be a part of his uniform, you affix it to his shirt as soon as possible. He earned it, and he deserves to have it displayed. Thank you. A uniform is something that a Scout can help pay for himself by assigning him various chores around the house, or helping out with other home projects. Also, keep in mind that uniforms, Scout accessories, camping supplies, and other ‘Scout stuff’ make excellent birthday and holiday presents for your son or the Scouter in your family. Inside the Alamo Area Council Service Center. In addition to uniforms, they carry everything you see in the Scout Catalog and then some. Enjoy the time spent there! Your son will love it!